Jim Ragsdale, the principal of RE/COR Inc., co-owned and operated one of the largest and most respected roofing companies in the Denver Metro Area from 1972 to 1990 with branch offices in Pocatello, Idaho; Casper, Wyoming; and Houston, Texas. While operating the roofing company, several roofing manufacturers consulted Jim Ragsdale routinely for his expertise and opinions in reviewing installation manuals and testing roofing products. 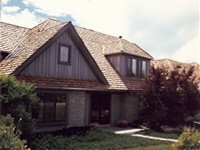 Established in 1990, RE/COR Inc. specialized in re-roofing, high-end custom new construction, and roof consulting. After 1998, the company no longer sold or installed roofing products and concentrated instead on roof consulting and inspections. Jim has been very active in editing and writing proposals for improving and changing building codes for the roofing industry in the International Building Code and the International Residential Code of the International Code Council. There are few, if any, companies whose main business is the inspection of roof installations as ours is. We perform a Roof Inspection Service - we do not sell or install roofing products or represent any roofing materials or installation companies ~ so there is no conflict of interest. Throughout the roofing industry our reputation is well known as being very knowledgeable, fair, and helpful, but also tough, strict, and not missing much. Our roof inspections are performed with consistency and we treat every roof the same no matter who roofed it. The citizens of Greenwood Village and the other Cities/Counties where we have performed our Roof Inspection Service have been very appreciative of our thoroughness in making sure the roofs have been installed correctly. Many have thanked us personally and several have written letters to their respective building departments stating their satisfaction for giving them the Peace of Mind of knowing their roofs have been properly inspected. Our expertise is in all types of Steep-Roofing products including asphalt shingles, cedar shakes, clay and concrete tile, new alternative roofing materials and some flat roofing materials. We really know our business with over 40 years in the roofing industry and more than 24,000 Code Compliance Roof Inspections performed for various City and/or County Building Departments here in Colorado. We have the knowledge, the experience, the reputation, and the desire to solve your roofing problems. We do not guarantee your roof will be free from future problems or litigation but we will greatly decrease the odds.